Asbury Hills is dependent on volunteers to help us to continue providing a quality ministry. 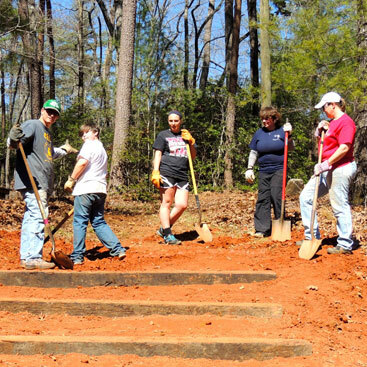 There are a variety of service opportunities available—from maintenance and repairs to building picnic tables to helping clean up around camp. Such projects are great bonding experiences for your group, all while contributing to the ministry of Asbury Hills. Who can serve as volunteers? Sunday School classes, men’s, women’s, senior, youth, college groups and organizations of any kind are always invited. All skill levels are also welcome. What projects can we do? There is a variety of projects at Asbury Hills that we need help with, ranging from clearing brush to framing and expanding living areas. A complete project list is available upon request. Contact Kevin Owen, Facilities Manager, at 864.836.3711 or [email protected] for more information.